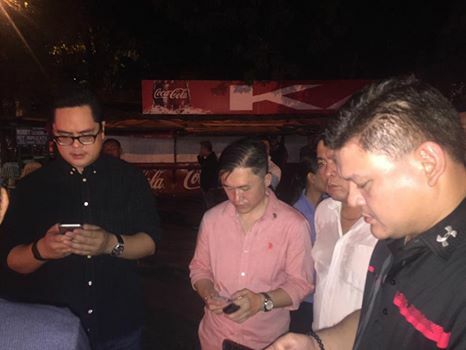 President Rodrigo Duterte's son, Davao City vice mayor Paolo "Pulong" Duterte has issued an official statement after the explosion Friday night. Let us pray for the victims of this unfortunate incident, especially for those who died. Let us pray for those who are being treated in different hospitals and pray for their quick recovery. There are at least 10 people who perished because of the incident and a number were reported wounded. Rest assured the authorities are on top of this incident. Right now, we cannot yet give definite answer to as to who is behind this as we are also trying to determine what really exploded. It's a sad day for Davao and for the Philippines. Duterte's statement was posted on the City Government of Davao Facebook page. Speaking to reporters, the vice mayor confirmed that at least 10 people died and about 60 others were injured. The public official said the exact cause of the explosion is yet unknown, but he received initial reports that an LPG tank exploded in the massage area of the blast site. At around 1:36 a.m. on Saturday, September 3, CNN Philippines reported that according to the Davao City police, 14 people died and 67 others were injured in the blast. Duterte urged Davao City residents to stay in their homes and the bar owners to close their establishments. He clarified, however, that the city has not been placed under a lockdown. The presidential son said a threat to bomb the Ecoland bus terminal has reached hotline 911 operators. Last July, the younger Duterte revealed that Davao City is under ISIS threat. During a press conference, Duterte as the acting mayor said he has ordered the military and police to beef up security and intensify intelligence gathering to prevent attacks by the international terrorist group.